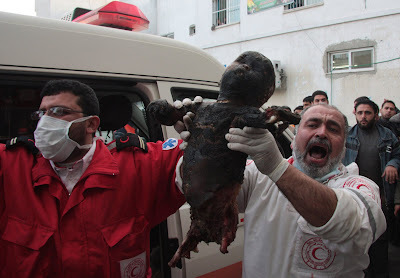 This entry was posted in Israeli terror, Israeli War Criemes, Phosphorous Bomb on January 26, 2009 by harbic. GAZA – Blankets of white clouds covered the skies over Gaza, including the refuge camps in Khan Younis, Beit Lahia and Gaza City.On Saturday Israeli F16 warplanes launched attacks using phosphorus bombs on the Block 2 section inside the densely populated Jabalya Refuge Camp.Many residents of Jabalya escaped the area covering their faces, searching for a safe shelter in the home of relatives and friends in the neighboring Beit Lahia from the Israelis “Cast Lead Operation”. Gaza has always been the Israelis “testing ground” – from nerve agents used in Khan Younis in 2003, to Sonic Boom “phantom air raids”,and the use of DIME in the Israelis massacre called ” Operation Summer Rain” over Gaza year 2006. In the dark night the terrifying sound of Drones [small, pilot less planes,] can be heard overflying the northern parts of Gaza Strip.Most deaths and injuries from Israelis air strikes, are caused by Drones. Drones are using precise remote-controlled devices to launch missiles against targets.A Drone can launch bombs, also take photos of the small number plates on cars thousands of meters below on the ground, also recognise and track location of the signals from mobile phones. On Friday,PCHR,the Palestinian Center for Human Rights in Gaza accused in a statement, the Israelis of using phosphorous bombs over Gaza Strip.Raji Sourani, the chairman of PCHR, said that “This is not the first time we [PCHR] have documented the Israelis use of prohibited chemical weapons against the Gaza civilian population.The HRW Human Rights Watch senior analyst Marc Garlasco said in an interview on France Chanel 4 TV that ..”Israeli artillery bursted fire of white phosphorous shells over Gaza City.”Garlasco said ..”I have been standing at the border for the last few days ,watching Israeli artillery firing white phosphorus shells into refugee camps”. On Sunday,the Israeli military denied the accusations saying that “We would not discuss what weapons we are using.”I can assure you we do not use any weapons that are prohibited by international law. We know that other nations are using phosphorous bombs,we have the right not to comment on this”, the Israeli military spokesperson added. During the first invasion to Iraq, the US occupation forces used phosphorous bombs against the civilian population in Falluyah. Also the Israelis were accused of using phosphorous bombs against civilian targets in Lebanon during the 2006 Israel war on Lebanon.The Israeli at firsts denied the charges, however when the following investigation overwhelmingly proved and confirmed its findings,the Israelis could not deny the evidences. The director of the emergency at the Shuhada Al-Aqsa Hospital in Gaza City,Habas Al-Wahis told journalists 3 years ago that in several cases, the legs and arms of the injured were sliced from their bodies, Al Wahis said – “as if a sharp saw was used to cut through the bone, however there was no evidence of ordinary metal shrapnel in or near the wounds. At the Al Shifa Hospital also in Gaza City, Dr. Juma Saka,said then, in 2006 that, – “our hospital found small entry wounds on the bodies of the dead and wounded, and a powder on the victims’ body, and in their internal organs. According to Dr, Saka “The powder is like microscopic shrapnel, likely it caused the injuries”.Italian journalists from the Ray TV news network,the channel 24, brought samples of soil from Gaza, back to Parma in Italy.The samples was examined by Carmela Vaccaio, a doctor at the University of Parma, and it turned out that the samples had a high concentration of carbon,copper,aluminium and tungsten. “These findings could be in line with the hypothesis that the weapon in question, was a dense inert metal explosive or DIME” said Valesco. DIME [ Dence Inert Metal Explosive]is a carbon encased missile that shatters into minuscule splinters on the impact.The missile sets off an explosive that burst out,blades of energy-charged,heavy metal tungsten alloy powder, (HMTA), such as cobalt and nickel or iron, with a carbon fibre casing.At the impact the material turns into dust, as it loses inertia very quickly due to air resistance, burning and destroying everything within a 4 metre range, as opposed to shrapnel which results from the fragmentation of a metal casing. Tungsten, the main material that would stray outside of the target zone, is also said to be highly carcinogenic and harmful to the environment.According to New Scientist magazine, John Kalinich’s team at the Armed Forces Radio biology Research Institute in Maryland said, that in a study designed to simulate shrapnel injuries, pellets of weapons-grade tungsten alloy were implanted in 92 rats. Within five months all the animals developed a rare cancer called rhabdomyosarcoma.The carcinogenic effects of HMTA have been studied by the US Armed Forces since at least 2000 (along with depleted uranium). These alloys were found to cause neoplastic transformations of human osteoblast cells. This entry was posted in Over Northern Gaza, Phosphorous Bomb, Rain on January 26, 2009 by harbic.